Meet The Greenhouses - The Stars of the Show! 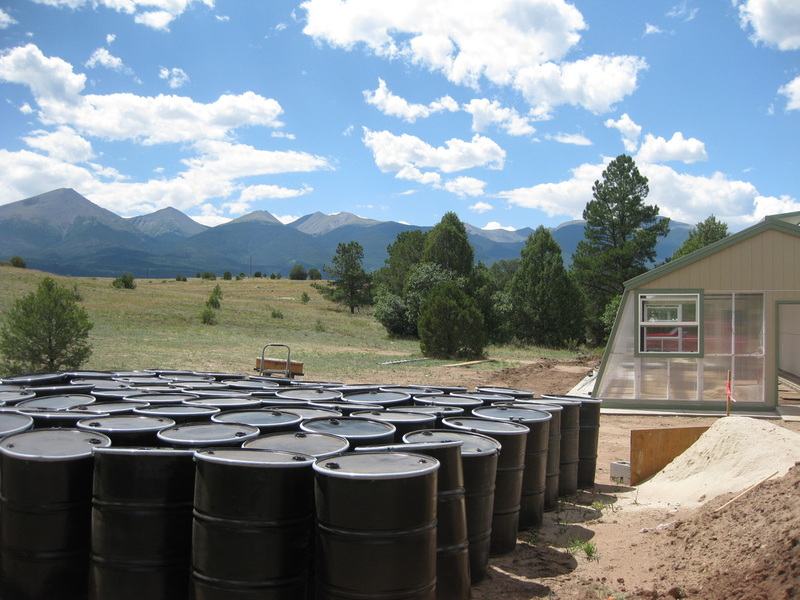 Our passive solar greenhouses are 100% sustainable. They perform on their own year round with absolutely no fossil fuel, we don't even have to plug in a fan. Stored water, balanced design, double glazing and natural convection are just some of the ways to greenhouse freedom. Once you've built one of our greenhouses, you will see that it begins to work for you - not the other way around. NO FUEL BILL. Our greenhouses have brought tomatoes through 31 below zero - the greatest test we could make. If your plans need the greenhouse to do more than that - you can add active solar or other ways to tap into nature's way of heating and cooling the earth. Check out what Cord did! This is the greenhouse at night - in Hillside. Beautiful! Completed August 19th, 2011 Designed and built by Cord Parmenter and Team. 18.5 X 44' ROCK ON!!!!! Totally sustainable - state of the art - full-tilt boogy! In the daylight - the last day. Max, Cord, Beau. Our good friend and partner Pat - nice office huh? Closed shed off the back. Open shed off the back. Barrels waiting to go in. The same tomatoes from the night-time pic - in January! Colorado snowstorm. Vent cover to keep snow load off one winter vent. The most current inside shots - they continue to dig beds! Nasturtiums going crazy with snow all around. Leaning into the wind. Plenty of room for the vent to open. 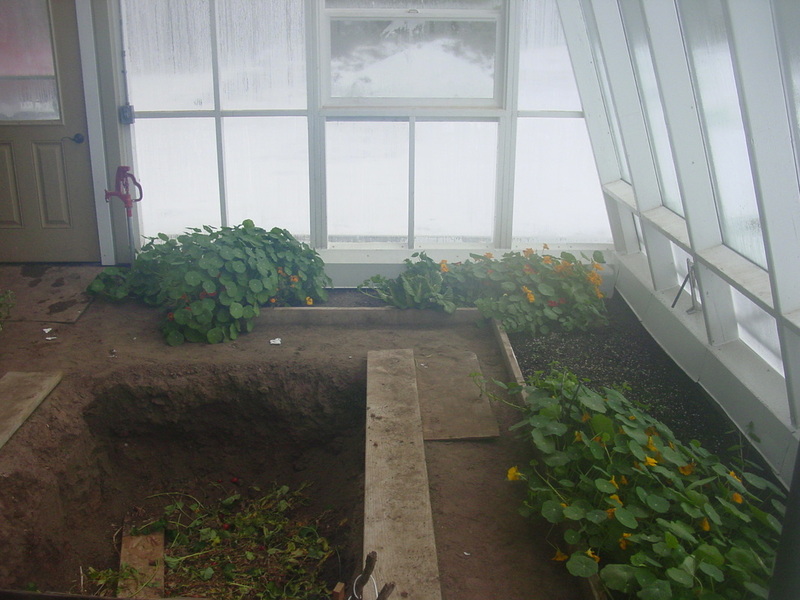 This is Penn's Greenhouse and the first one we built. We built this simple greenhouse for about $150! We salvaged almost all of the materials and this little 10'X13' greenhouse has rocked out the food for the last 14 years - 365 days a year! Our sustainable greenhouses run themselves year round with the use of stored water as thermal mass. The water both heats and cools the greenhouse - regulating it in spite of Colorado's wild fluctuating temperatures. 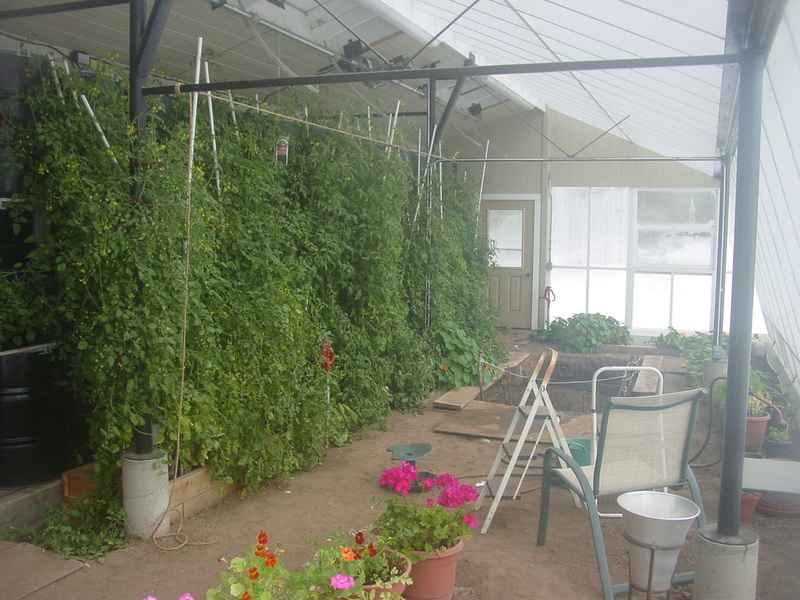 Cord 'approximated' this greenhouse then improved upon the design creating his 13'X16' totally optimized greenhouse, below. 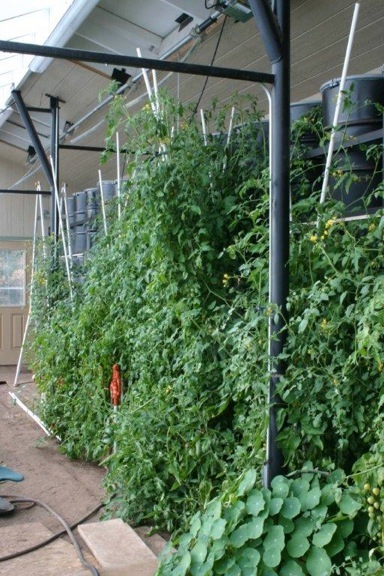 Cord's greenhouse can grow tomatoes year round with no supplemental heating - it brought the plants through temperatures as low as 31 below zero! Enjoy the pictures. Sunset time in early summer - corn, squash and beans coming. 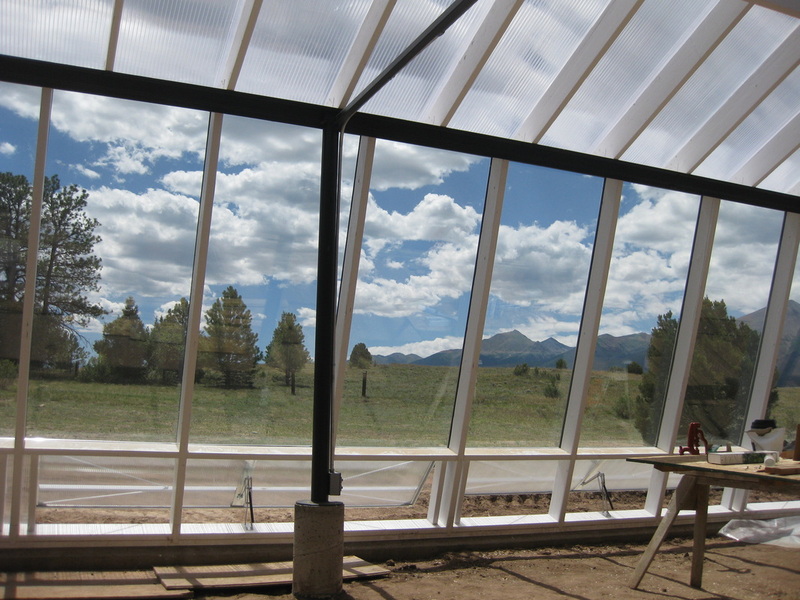 Cord's 13' X 16' greenhouse is an excellent example of a very efficient design in Passive Solar building. It is compact and it can produce an amazing amount of food; it has withstood incredibly low temperatures and has performed far better than the science it comes from says it can. Part of it is so many days of intense sun in the mountains and the west, the other is improvement on the design and using the optimum amount of water. The concrete slab at the back is to stabilize the barrels. They stack up the back walls - 3 high. 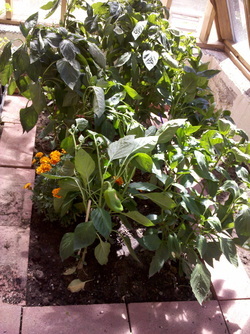 Native soil is double dug for beds with compost added. Worms help to keep the soil healthy. Plants always know the difference when they are planted in the earth - instead of pots or containers - and they will perform much better in the ground. This is the greenhouse design taught in our class: Sustainable Greenhouse Design. Penn's Fully Loaded Greenhouse - removable shelves. Penn and Bok Choy in her sanctuary. Ultimate greens with tomatoes coming under the jugs - in January! Plastic off, tomatoes planted in wells. Bottomless jugs go over tomatoes, filled jugs warm them on either side. 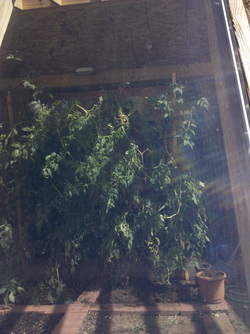 Jugs off, teenage tomatoes begin to take off. Joi Choi, Red Choy & Toy Choy - tomatoes coming. Turn your back and they've grown! These are all from previous greenhouse class members. Congratulations!!! What a Wall-o-Water! Big old water batteries. "A few of the neighbors who were doubting the greenhouse technology are now eating some of the tomatoes from the greenhouse; much tastier than eating crow." I say,Wahoo!Thanks so much for the belly laugh and congratulations on your most excellent passive solar greenhouse! Mountain-grown Galina's - yellow Siberian cherry - divine. You can do this too - using salvaged materials or new - or a combination of both. A passive solar greenhouse is a wonderful ecosystem that you are an important part of - without you to plant and tend the seed, nothing grows, but with you as part of the environment, a beautiful, abundant place like you see in these pictures can be yours.. The Holy Grail of the mountains - lots of tomatoes! Happiness... is your own greenhouse. Elevation - 8,600 ft!!! Sweet! "Most of the materials were repurposed from Craigslist, like all the sliding glass doors, and the trex shelving was actually free from a friends torn up deck. The insulation was from a recycle shop and my planter boxes were made from a torn down cedar fence. The metal was also free and collected over the years. The door was $10 at Habitat for Humanity. The 350 gallon water tank was used and very reasonably priced on Craigslist too. The lumber and roof was bought new." Simple water and extra insulation. Shading in high summer in La Veta. The setting - beautiful southern Colorado. Notice the thermal mass - concrete wall + water.